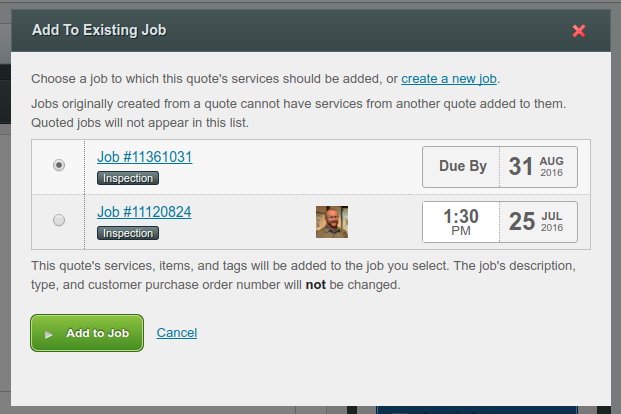 You can now use ServiceTrade to add quoted work to existing jobs. You can use this capability to quickly quote and repair deficiencies found during an inspection, or to create change orders for large installation, construction, or repair jobs. 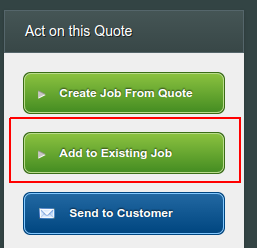 In the box that appears, choose the job to which you want to add the quoted work. IMPORTANT: This capability is available only on our new quote interface. For more information about this interface, please review this webinar. Your technicians can now view and add job items directly from the appointment page in the tablet interface, without needing to begin the Work Acknowledgement workflow. This information helps your technicians plan to get the correct parts that they need before arriving onsite. It also allows them to keep track of parts that they purchase from parts houses when performing work in the field. Technicians who have been granted the "View and Edit Job Item Costs" permission can now also record the cost of items that they purchase and use on a job. More information about job item costs and gross margins is available in this article. You can now add scheduling and tech comments to a customer at the company (top) level, and those comments will "cascade" to every location under that customer, and to every job that you perform for that customer. Previously, you could only add cascading scheduling and tech comments to individual service locations, which meant you had to create many location-level copies of a comment that needed to appear every time you did work for a customer that owned many different locations. Users of our Service Reviews feature can now easily send review requests to your customers directly from the job page. 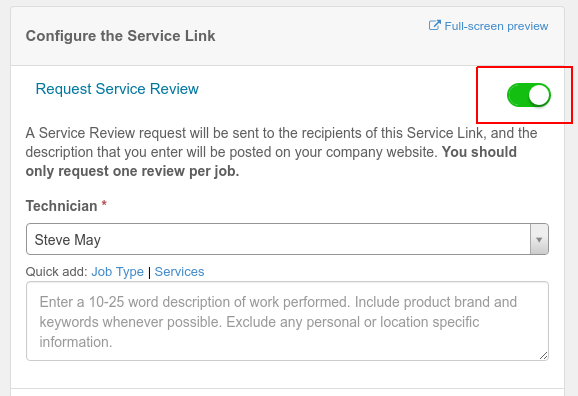 To send a review request to your customer, simply click the "Request Service Review" option when sending a Service Link to your customer. Choose the technician whose work is being reviewed. When selecting the customers to whom you want to send the Service Link, click the blue "Request a Review" star next to the customer who should receive the review request. For more information about subscribing to our Service Reviews feature, please contact sales@servicetrade.com.